Mary walked along the rutted road toward the river, the bucket handle digging into the palm of her hand. The metal pail held lunch for the tobacco workers and it was getting heavier the farther she got from the farm house. She could smell the sandwiches, but she wasn’t tempted to sneak one out from under the checkered towel. She’d already eaten a fried chicken leg and two biscuits while her mother packed the rest of the food. The sandwiches were made from scraps of meat on plain bread with butter. The bucket was big and it banged against her leg, just above the ankle. She switched hands and let it bang on her other suntanned leg for a while. Mary was eight years old and she’d been taking lunch to the workers down on the river all summer long. Sometimes her cousin Jim would come along. He was ten years old and strong and he liked to help carry the bucket. Mary’s feet hurt a little in the shoes she was starting to outgrow. She set the bucket down and turned to look back at the farm house. Blue and white shirts were blowing in the breeze, all strung up on a clothesline near the dog yard. She wished she could go back there. Maybe just hide the bucket behind some bushes then go back to the house like everything was fine and dandy. No, she wouldn’t do that. She wouldn’t disappoint all those hungry people waiting by the river for their lunch. 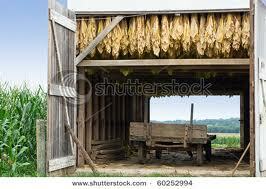 The tobacco workers had to watch the leaves drying in the barn every minute of the night and day. They kept the fires going constantly and made sure that nothing else caught on fire. They had to get the tobacco dried. Mary liked the part of tobacco farming when they bundled the leaves together better than this time of year. She didn’t have to carry the lunch bucket on those days; and she always liked touching the leaves and seeing the black stuff that got on her hands. Tar, they called it. The leaves were big and pretty then, and so green! Now they were brown, hanging upside down to dry and wither up. Mary picked up the bucket and knew that just up the road was the scary part of her journey. That’s where the side of the road dropped off and where it looked like a person could just trip and fall down into the river…tumble all the way down the steep drop and probably hit their head on a tree and then drown. No one would find anything except maybe a stray lunch bucket to mark the spot where a person went missing. Mary was terrified of falling down that steep cliff, even though she could stay on the other side of the road to keep clear of the edge. The only time she could walk along this section without fear was when Cousin Jim strode along beside her. He’d sing songs to help get her mind off of falling. Mary tried singing now. “One, two, buckle my shoe…” It helped just a little bit. Crack! Something in the brush snapped and startled her. She paused and held her breath, listening. Her heart pounded and the bucket slid to the ground. Mary looked to her right and could see where the drop-off was. She craned her neck all around, scoping out the trees above and the shrubs below, but nothing looked out of place. She lifted the lunch pail and walked on, as fast as her aching little feet would carry her. where the workers would be cooling off, swimming and splashing and waiting for their meal. There would be cheers when they found out the bucket was full of big sandwiches! Mary wished she could hear their voices, but she wasn’t close enough yet for that comforting sound. No, she was still walking in the dark shade of the thick pines that lined both sides of the road, even on the side where it dropped off. A tremendous gust of wind breezed through all of a sudden, lifting up her dress and sending the cloth over the bucket blowing across the unpaved road. Mary’s reflex reaction sent her following after it without fear until she arrived at the very edge of the cliff. She came to an abrupt halt, upon the tips of her toes, and at that same moment heard footsteps rushing behind her! Already frightened from her precarious position, she whirled around, heart pounding, and heard, “Boo!” She was grabbed and pulled away from the edge of the road before she realized that it was her cousin Jim who had sneaked up to surprise her. Knowing he had seen the tears in her eyes, she wiped them away then followed along by his side as he started singing a funny tune he made up as he went along. They passed the crest of the hill then started down and around the curve of the road and she could at last hear the voices of the workers splashing around in the river. Everything looked serene and smelled sweet; even the smoke from the fires in the tobacco barns. She glanced toward the sheds and could see that some of the tobacco leaves were still green, just the way she liked them. Mary laughed and delighted in his joy. “That’s funny. I thought it was just sandwiches,” she giggled. Jim didn’t need any more coaxing than that. He tossed his shoes and britches aside and took off for the tree swing. He landed in the clear water with a gleeful holler, and then Mary grabbed the rope and swung out. The water was crystal blue and clean, cool and refreshing. They swam and climbed on rocks and took turns practicing their Tarzan yells from the tree swing. It took a while for them to burn most of their energy, and then they climbed out and grabbed a towel from the woman who’d been watching over their safety. Mary’s dress hung heavy around her, so she lay on the grassy bank of the river to dry off in the sun. Jim plopped down beside her and when they caught each others’ gaze, they were so happy they burst out laughing. “Nothing; I didn’t say anything,” he answered. He looked calm and just a little sleepy. He winked at Mary in reply. Back on the crest of the hill, a ten year old boy and two men who had been searching the area made a grisly discovery. They first spotted a kitchen towel at the edge of the road, caught at the base of a shrub, and then with dread searched further down the sharp drop-off and found the little girl lying dead where she’d landed hard against a big tree stump. Her posture told them there was no hope of survival. A bucket of scrap meat sandwiches was spilled around her. It was the saddest thing Jimbo would ever see in his entire life. He let out a wail and then cried uncontrollably for Cousin Mary.